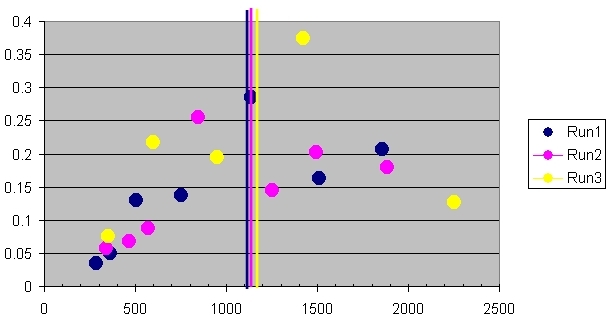 The plot gives the results of the above sims . X-axis represents the Sma in 1000 kms. 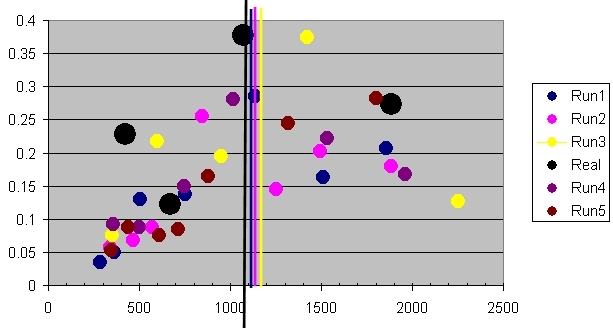 Y-axis is the % Mass distribution of each moon . Curious what the distribution will be if more simulations are run . The thing we have to keep in mind is that this isn't the whole story - there's things like gas drag within the protosatellite disk, and more material coming in from the protoplanetary disk as well. Plus of course the lack of tidal interactions (which will be important for the innermost objects). But I think this is still useful to give the right kind of idea for how regular satellite systems can form. 305 bodies (purple, moonlet) <-------------dense second ring of material at fixed distance within main disk. - I made two belts - a main "tiny" belt containing 600 bodies at 5e20kg, from 300k-900k (I think I accidentally set their ecc to 0), and a denser "moonlet" belt within the main belt containing 305 bodies at 1e21 kg from 600k to 650k with ecc 0.00-0.05. - it only took 17 years to form the four satellites. - However, the moons are listed in gravsim in a strange order - the two outer moons are listed first, then the two inner moons. I have no idea why. - Bizarrely there is MORE mass here than there was to start with?! I have no idea how that happened, I seem to have sprouted an extra 3 "tinies" worth of mass (6.065e23 kg total instead of 6.05e23 kg. I was sure that I had 600 tinies (3e23kg total) and 305 (3.05e23 kg total) moonlets...! I guess I must be wrong about that but... weird! - I did however end up with a larger moon around the 600k distance, with the other three moons being about the same sort of size as in the other sims. I'm not sure if the largest moon formed first though (my collision.dat file for some reason didn't record this gsim?) - as far as I can see the last body in its neighbourhood that might have been in its neighbourhood was moonlet 97 which disappeared at year 3 (it hit either 63 or 135), then 317 and 318 merged closest to the planet at year 17 and there were four moons after that. - Very strange. Maybe someone else could regenerate the run from scratch and see what they get? initial gsim for run #5. I had the same experience with missing or added mass . In my 5 runs with 400 bodies each there was a loss or gain of maximum 5 body masses (395...403 ) . I didn't pay much attention to it . Missing mass could just be mass ejected from the system (it'd be nice if there was a flag for that). But if mass is being added then there must be a bug there somewhere... Tony, any ideas? Mass should be conserved. It could be a bug. Can you send me before and after sims? The "before" sim is attached to the previous post, it's the AccraMoonFormation0000r5.gsim file. Can you see what's going on with the moon sizes as well? They don't seem to increase in radius as shown in the gravsim window, though they are increasing in radius in the file itself. Mal , for some reason your above program terminates after some seconds without warning . I don't know why . I had this with some other simulations , I think when there are some bodies merging from the start , but this isn't the case in your simulation as I can see move the timer . 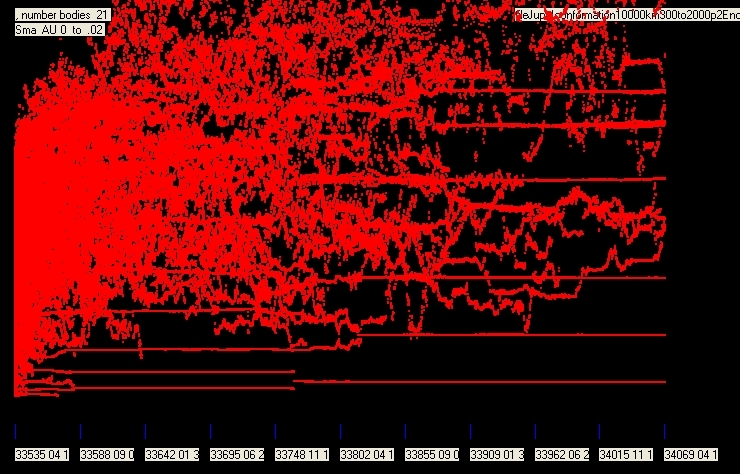 Hereunder is the result of 5 sims I've made with 300.000-2.000.000 km range around Jupiter ( 400 circular bodies ) . Black circles are the real thing . The distributions seem to match relatively well , except for the innermost Io which has about 3 times more mass . If the smaller inner moons are merged into each other the situation might correspond better to reality . Maybe Io really was created by merging some smaller protomoons orbiting close to Jupiter as a relict of Jupiters creation itself ? I get the same problem as Frank. I'll have to debug this. As far as size, your objects are 860 km and your screen scale is 16 million km. So each pixel represents 10000 km. So one has to be larger than this before it is bumped up to 2 pixels in size. - this time it took much longer to form three satellites - 1127 years. Before that, there were four moons since year 94. - This time the total mass was 6.045e23, which is one "tiny" less than what we started with. - This time the masses were listed in the right order in gravsim. And here's what the run was like at the end when I stopped it. ---> 7 moons with a lot of bodies as start of a new sim . Result : the 7 moons which were stable end up with 4 moons + ca. 20 original small bodies which sma increases with time . The result is shown in red , whereas blue represents the original sim and black is the Jovian configuration . Interpretation : adding smaller moonlets will reduce the number of big moons . The merging occurs very quickly in the inner region . The outer region needs more time to merge . Some moonlets will not be merged but will escape the system over longer timeperiods as their eccentricity builds up . 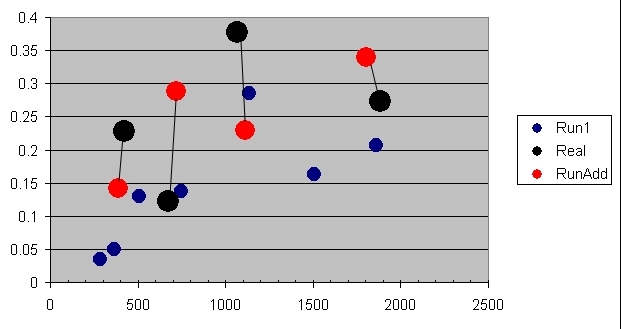 The evolution of the individual moonlets' Sma can be seen here versus time . The inner space is rather quickly cleared as the moonlets mere with the existing moons . Some inner moons also merge . The outer moons need more time to merge . Result is that the system "ends" with 4 big moons and about 20 very tiny moonlets at high eccentricity .